Come Fishing in RI with the ThomCat Charters. Enjoy catching Summer Flounder and other inshore gamefish along the Rhode Island South Shore with ThomCat Charters. Capt. Thom has been fishing Narragansett Bay and the Rhode Island south shore for over 40 years and has written numerous articles on fishing in Rhode Island for On the Water, The Fisherman, Saltwater Sportsman, Nor'east Saltwater, and Northeast Boating magazine. Thom also markets his own line of Fluke rigs via ThomCat Tackle. These rigs are proven fluke-killers, and could only have been designed by someone who has spent years on the water studying that species' habits, as Thom has. 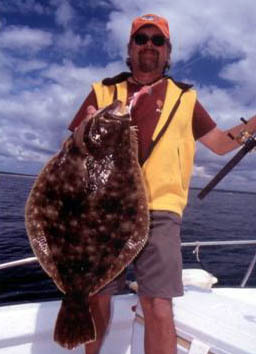 He is widely recognized as one of the premier authorities on fluke fishing in Rhode Island. Due to the state of the economy and with the increase in fuel cost we've decided to raise our prices for 2011. These RI prices will remain for as long as costs allow. A fuel surcharge may be required, depending on how high fuel prices go this summer. A 50% deposit is due 10 days after reservation is made. If a charter is cancelled within 5 days of the date and the day cannot be rebooked, half the deposit will be forfeited. Cancellations by the captain are subject to a full refund. Please feel free to contact me with any questions. About the Boat & what to bring with you. The boat is a 21’ SeaHunt Center Console. You may want to bring drinks and some snacks, depending on how long we are going to be out. A hat, sunscreen, and long-sleeved shirt or sweatshirt might be good. Soft, non-marking soles on your footwear is required. The Boat can comfortably accommodate up to two anglers and the captain. Please keep in mind that storage space is limited so try not to bring too much stuff. "It is my sincere hope that a trip with me will provide an enlightening and entertaining experience for each angler as well as an opportunity to tangle with some of Southern New England's top quality inshore game fish...... Catch'em up!" Closer to Connecticut than the Galilee and Point Judith fishing fleet.